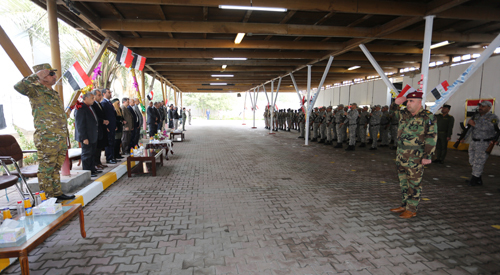 The Protection Force of the General Secretariat of the Council of Ministers organized a military review of its units and mechanisms, on the occasion of the army and police posts, in the presence of a group of Directors-General of the General Secretariat of the Council of Ministers. The K9, UNPROFOR, and riot control units showed high review capabilities, while the review included the effectiveness of the procession during the course of travel, the evacuation of the official during emergency situations. The review also saw the mechanism of inspection of the wheels, the withdrawal of unlicensed weapons, the inspection of the K9 dogs' unguided wheels, which are given orders remotely, as well as the medical unit that intervenes in case of any incurable illness, first aid or certain injuries.